Dawn Of The Nine will be the name of the twelfth studio album by Swedish death metal pioneers UNLEASHED, due out in North America this spring via Nuclear Blast. "A New Day Will Rise"
"Where Is Your God Now?" "Land Of The Thousand Lakes"
"Welcome The Son Of Thor!" 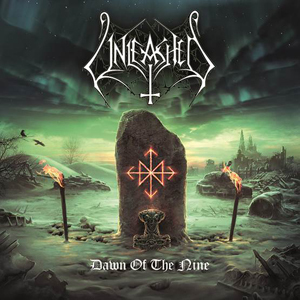 With a career spanning twenty five years, UNLEASHED are credited with founding the Viking Death Metal movement back in 1990, when they were among the first death metal bands to write songs about their Viking/Scandinavian heritage. Two and a half decades later, their riffs are still register as shrapnel and their choruses are just as epic as they continue to meld uncompromising brutality with anthemic odes to the pantheon of gods in Norse mythology, most especially Odin - ruler of Valhalla.